Where will an SJSU degree take you? How about beyond the Earth’s atmosphere? While Ali Guarneros Luna, ’10, ’12 Aerospace Engineering, has her feet on the ground as a systems engineer for NASA Ames Research Center, she has been involved in projects that have made it to outer space. Guarneros Luna lead an SJSU student team that worked on the cube satellite, TechEdSat, one of five cube satellites, or cubesats, being transported to the International Space Station. A transfer vehicle containing the cubesats, additional experiments and supplies launched from Japan at 7:06 p.m. PDT July 20. TechEdSat is the first NASA cube satellite that will orbit the earth after being launched from the International Space Station. Becoming an aerospace engineer was a childhood dream for Guarneros Luna, who grew up in Mexico. “I read something, I saw something on TV when I was probably five or seven years old, and it just impacted me,” she said. 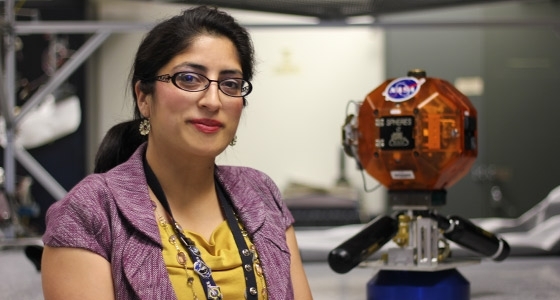 She earned her current job after interning at NASA Ames during her last year of undergraduate studies, where she made connections with SJSU faculty members who also worked at that research center. “I was just lucky enough that … San Jose State University gave me the opportunity to pursue the dream that I had when I was growing up,” she said.